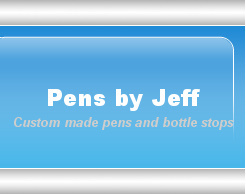 Pens by Jeff - creator of custom made, one of a kind pens, pencils and bottle stops. Pens by Jeff creates custom pens and bottle stops out of wood ( exotic and domestic ), acrylic and other materials. if you have some wood that holds a special place in your heart or has special meaning to some one you know. What better way to create a lasting memory to continue through the generations than to have a custom pen and pencil set made from it.